I gave a lecture yesterday on the media, popular culture and the environment with the subheading ‘Is popular culture costing the Earth?’ It’s the first time I’ve tackled this subject in class in any depth since it had simply never occurred to me before that the media had any discernible environmental impact. I’d assumed that the creative media industries were relatively clean and green, certainly in comparison to the old heavy industries that are commonly associated with fossil fuels and polluting black smoke. But when you consider that contemporary popular culture is dependent upon electricity – just think about your own domestic consumption via TVs, DVD players, games consoles, phones, radios etc – then suddenly you begin to appreciate just how much energy is involved and the subsequent CO2 emissions. 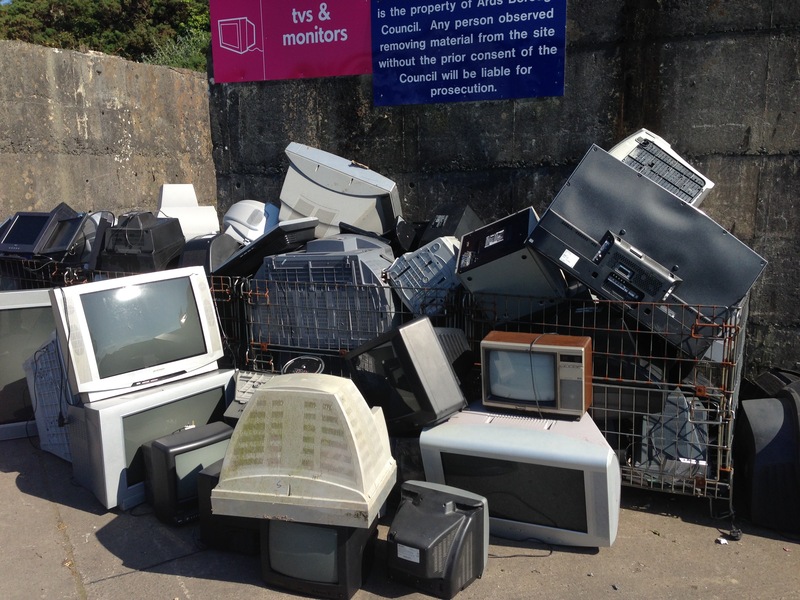 On the other hand, take a trip to any dump to see the mountains of e-waste – obsolete TVs, mobile phones, computers etc – and again, the environmental consequences of popular culture become apparent. I suppose the energy and waste involved in the production and consumption of popular culture didn’t come as that big a surprise to me but the carelessness (or eco-vandalism) of the film industry did. Richard Maxwell and Toby Miller recount two occasions in their book Greening the Media (2012). In preparation for the making of Titanic (James Cameron, 1997), Fox Studios renovated the Estudios Churubusco in Baja California, Mexico, attracted there by the promise of lower production costs. They built a huge water tank near the fishing village of Popotla and a 6 foot high, 500 foot long wall to keep villagers away, barring local access to the beach and fisheries. They also chlorinated the surrounding sea water, decimating sea urchins and reducing fish levels by a third, which you would imagine would be pretty catastrophic for the fishermen in the village. A similar disregard for the natural world was shown during filming of The Beach (Danny Boyle, 2000), also a Fox Studios production, when producers took bulldozers to the Maya Beach, part of the Phi Phi Island Natural Park in Thailand, because the idyllic natural scenery wasn’t quite idyllic enough, apparently. They relocated sand dunes and flora, and planted coconut palms. But the sand dunes collapsed when the monsoons came because the natural defences that preserved them had been destroyed by Fox Studios’ bulldozers. Still, the Thai government was slipped a few bob for its Royal Forestry Department and Fox and the local tourist board campaigned together to promote the film. So s’all good! Mulling all this over on the eve of the lecture I wondered was there a local angle and I google the obvious choice: ‘Game of Thrones’ and ‘environment’. I found a discussion as to whether the TV series’ own climate makes any scientific sense and the idea that the show might actually be helping its audience get to grips with the climate change debate, but also this: Did HBO Destroy an Ecosystem for Its New Show? As well as the Malta Times coverage cited above there is also an interesting blog post that castigates the Malta Environment and Planning Authority for screwing up big time on this occasion. By now we should all be familiar with the strategic and economic importance that Northern Ireland’s (currently part-time, casual) executive places on global media events as a way to project the region on to the world stage, in the hope that this will attract inward investment and tourist dollars. But would the executive play fast and loose with our environment? As Maxwell and Miller point out, there is a political economy to the sort of environmental destructiveness that Fox Studios have been associated with, “shaped by economic-structural adjustment peddled by neoliberal high priests at the World Bank, the International Monetary Fund, the World Trade Organisation and the sovereign states that dominate them.” (2012: 71) Countries on the periphery of metropolitan capitalism are being encouraged to sacrifice social and environmental sustainability for foreign investment, tourism and entry into the global free market. Northern Ireland is among them. Here, global media corporations are given financial sweeteners and ‘access all areas’ while the region is touted, in the words of Northern Ireland Screen, as “the most compact 5,196 square miles of back-lot in the world”.